How did I get those spoons to stick to the glass surface? If you want to discover my secret, "stick around" and I'll show you. 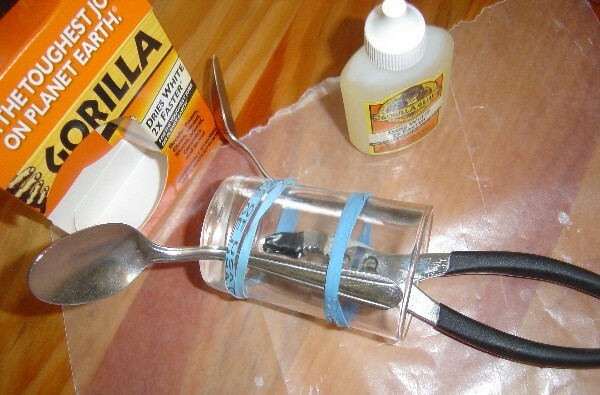 This Gorilla Glue solvent is extremely easy to use, bonds a LOT of different surfaces, but be sure to read the simple instructions on the box and/or bottle before each use. Make sure to spread a thin line of glue. That is all that's needed. The glue will foam and expand in volume once applied. I used too much the first time, but that really wasn't a problem. After the glue had completely dried (about an hour) I used the flat end of a razor and scraped the excess glue from the surface of the glass. 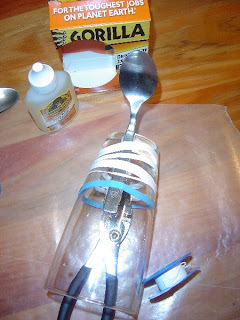 I used thick rubber bands (the ones that are on asparagus bunches from the grocers) and the white "plumbers" tape to clamp my spoons securely to the glass. (Either of these or both will work beautifully!) 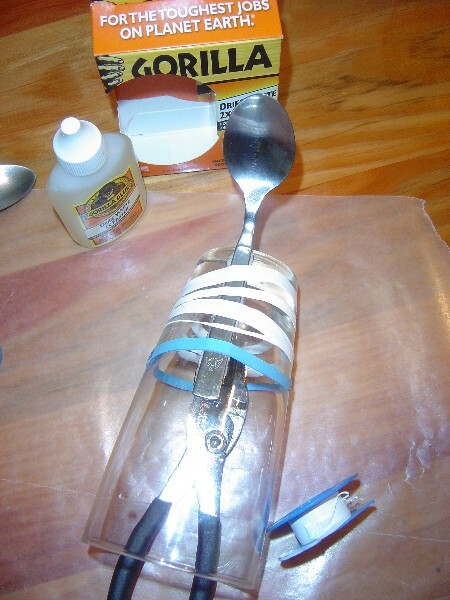 Put the rubber band around the surface of the glass ABOVE where the spoon will adhere. Be sure to do this BEFORE you apply the solvent. 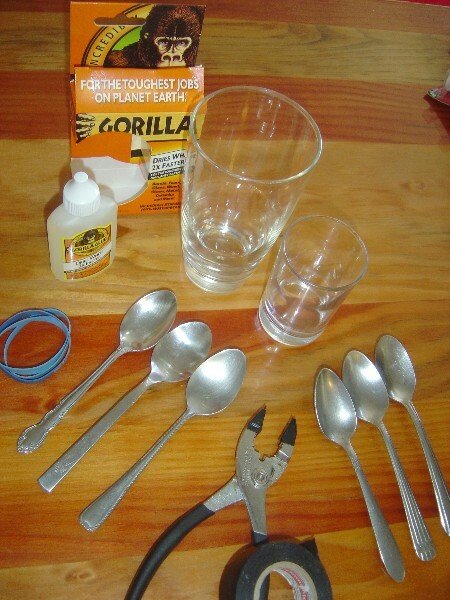 Apply Gorilla Glue, slip the rubber band over the spoon and secure in place with plumbers tape. I had to use pliers to bend one of the spoons that I couldn't manage by hand, so I wrapped tape around the end of the pliers so the surface of the spoon wouldn't be damaged in the process. Really, that's all there is to it. 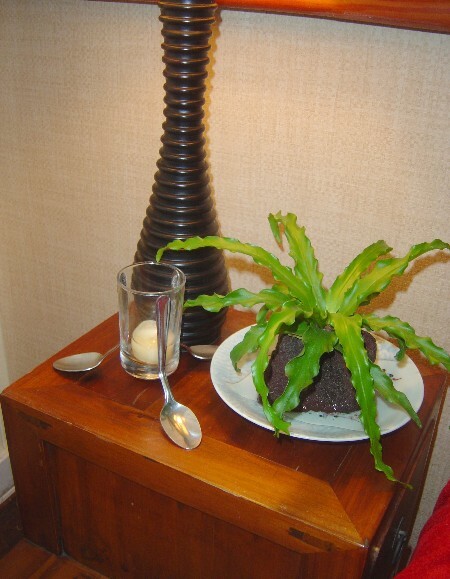 In a very short time and for incredibly little money, I managed to transform two inexpensive drinking glasses and six old spoons into an elegant vase and votive holder. (Ti leaves and ginger are free from my backyard.) Now that I've experienced how phenomenal Gorilla Glue works and how easy it is to use, I've got projects and prototypes spilling out of my head :) BTW, it's incredibly strong and oh, did I mention it was waterproof? Linking to the DIY Club Inc. - July Party and Friday - Follow and Motivate Me Monday at Keeping It Simple. On Tuesday, it's Tuesday Tag-Along at Twee Poppets. Rounding out the parties is Under $100 Linky Party at Beyond The Picket Fence. Come join the fun! I love that! What a great idea!! New follower from Friday Follower! WOW!!! This looks like something that would cost ALOT of money if you went out and bought it! Gorilla does rock! You used it wonderfully here!! Such a great project that adds some unexpected whimsy to your space. Very clever, fun, and functional. Well done! Been following your blog for a while but wanted to stop in and say hello for Friday Follow. I love your blog! Hope you have a wonderful day! Never heard of Gorilla Glue...very creative! Thanks for this, Pam. This could come in very handy for a lot of things around here. Wow! I've never seen anything like it before! Would love to try. Thanks for commenting on my wonder-water dog's newest adventure. It was hysterical! Next time, I'll be faster to grab my camera! Love it! Another great project, Pam! What an incredibly neat idea!!!! Came by from Friday follower and liked what I saw and became a follower that side bar button of "don't breed or buy while homeless die. love it --- would like to put it on my side bar too if you do not mind.. So creative! I get so inspired by all you creative bloggin' gals. I thought I was already following you...apparently not...but I am now! Pam, this is a very creative and fun project. Thanks for sharing the great tutorial. I really love it! 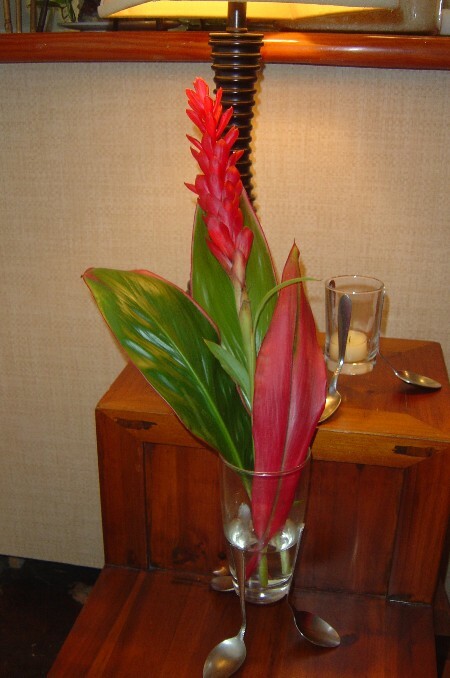 Nice way to snazz up a boring drinking glass and use it for something else useful! Very cool! Thanks for the tips! I am following you from Friday Follow! Hope you had a great weekend! I look forward to following your blog! Come visit Mama's Little Chick. Now if that's not the most clever idea I've seen in a long while. I love it! Hello! I'm your new 258th follower from the Tuesday Tag Along blog hop and I'm so glad I found your blog. What you did with those spoons was really unique. Great job. Hope you'll come visit and follow my blog too. I'd love to be one of your blogging buddies. Thanks. What a fabulous project. I shall have to try this. I love Gorella GLue also! I shall have to go looking for old spoons! What a creative idea. You are too creative. Wht a cute piece. Thanks so much for linking up to the DIY Club. Have a great weekend and keep crafting. I LOVE this...so fantastic! Don't ya love gorilla glue...hope some of those great ideas keep you linked to the next DIY Club party too! Awesome project, Pam ! You've got my vote ! CraftGossip Featured My Spooning! TOOT! YIPPEE! The Oz Scrapbook Giveaway Ends Tonight! Reminder! Wizard of Oz Giveaway! Choosing Colors Paint - Make It Easy! Wallpaper Decor - Isn't It Wonderful? Petal Pillow - Making the Best Pillow Corner! Thank You Lord! Alisa Maiers was Found!